Back when we were in Puglia in July, I snapped some of my favourite products at the time with the promise of a blog post 'coming soon'. Story of my life... And when last week I did an instastory on a few beauty hacks, your feedback connoted that you wanted to know more. and who am I to withhold all these pretty pictures / insider knowledge (other than just lazy, probably...)! Here is my round-up of the products I was using while still nursing and will be using all throughout the harsh of winter. What I love about all of these is that they are often plant-based and are mostly chemical-free, or at least won't pass chemicals onto baby if pregnant and/or nursing. Read on for luxurious, vital treatments to winter bodies brrr'ing everywhere. The Weleda Sole Toothpaste takes some getting used to. It is grainy, not sweet but slightly sour and doesn't foam. Still, I have a developed a strange affinity for it, party due to an unexpected, visceral sensation that arises when I chew on the grains (did anyone else ever enjoy eating sand or is this a farm girl thing?). Most significantly, the Sole toothpaste is absolutely nasty-free. Toothpaste is a bit of an untouchable, by which I mean that we never really question what these ominous tubes in our bathroom cabinet comprise of, as long as we like the flavour. You'd be surprised though how may chemicals hide inside said tube. Full of chlorides, fluoride and bleach - if you pay attention what goes on your skin and inside your body, you really ought to reconsider your teeth brushing habits too. just when you didn't believe in a happily ever after ... this pairing shows up for the perfect match. Aloe Vera: Aloe is a brilliant skin rescue for anything from dry skin, dehydrated skin, burnt skin, skin conditions and bruising. It is anti-inflammatory and helps with cell turn over so it is ideal for winter, without the irritation a retinol or fruit acid serum would cause. Apply post-cleansing and follow with Jojoba oil: though not strictly an oil, jojoba is a liquid wax derived from an indigenous american shrub. what makes it so significant is that unlike any other vegetable oils, jojoba is the closest in resemblance to the skin's natural sebum and so is the ideal product to use if you want to stay away entirely from anything engineered. It locks moisture into the skin and soothes a wide range of skin ailments, as well as controlling oily skin. Admittedly, the Iles formula conditioner isn't all that natural, but this discovery is too good not to share. developed by Wendy Iles, hairstylist to the pretty (&) famous, the conditioner in this range is a lifesaver for hair that needs extra. I've been trying to grow my hair out for what feels like a lifetime now, as well as regrow the hair that I lost postpartum. The combination of highlights and really hard water where I live isn't kind to my fine but plentiful hair, which tends to mat and dry out at the ends. After the first use of this conditioner my hair was manageable, really shiny and felt healthy and repaired. What I think makes this product really special is the fact that it acts as a hair mask, but can be used every day without weighing even fine hair like mine down. I do tend to only apply mid-length and then comb the product into the tips to avoid overuse or greasing. I am a big believer in the concept of faking till you be making and A tan is the job half done. I will not be making sun exposure any time soon, but on the other hand I have always been a self-tan sceptic ... until I discovered - jingle - ECO TAN. this product is vegan, not tested on animals, is certified toxic-free and gives the most natural, buildable tan I've ever, really never! If it sounds too good to be true and it is. 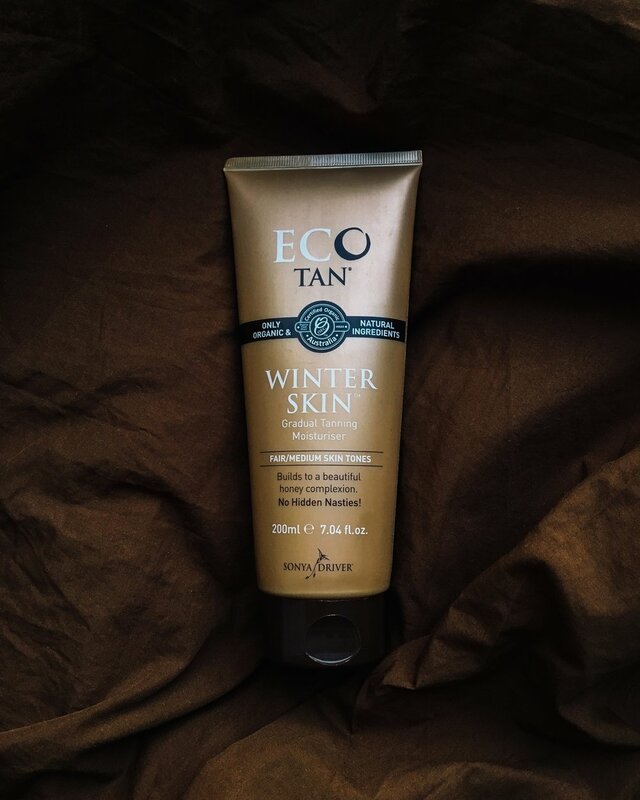 eco tan is built on aloe vera juice, chamomile flower extract, rose geranium oil, grape skin extract and cacao fruit powder. What astounds me is that it miraculously doesn't make patches, and it doesn't smell when developing. Due to the aloe and grape skin extract it moisturises nicely too. Never did I ever think I would be reviewing a self-tanner but times they have changed. Even if no one gets to see my honey tan underneath seven layers of thermal clothing. meh.